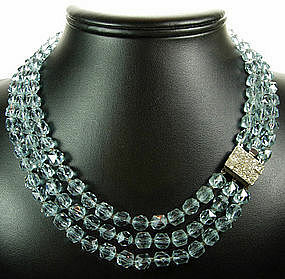 Fabulous vintage glass beaded necklace with color changing alexandrite lead crystal glass beads and tiny clear glass spacer beads. Circa 1940. With a beautiful geometric Art Deco pave diamante slide clasp in silvertone metal. From a Baltimore estate and I also have listed several 1940s signed pins and clips from this same estate. The color is a pinkish lavender in natural light, and a pale aqua in white artificial light. Both colors are more intense than the photos depict. Wearable length is 17 inches. 1 inch wide. Excellent condition. Slight wear on the back of clasp is not visible when worn. Photos enlarged to show detail.